The first step is to consider the amount you are willing to spend on these rings. After you've planned your budget, you can really begin to filter your search results for a diamond bridal set that is tailored to your needs and fits within your budgetary limits. Selecting a style - Decide as a couple what kind of ring style you both like. For some, it is a classic, simple style. For others, a more designer, edgy ring style might be preferred. It really is a matter of your combined tastes. Speak with your partner before you start shopping to figure out which style is best for you. Gemstone rings or a combination of gemstone and diamond bridal sets rings have become more popular in the 21st century. The total price of the rings can be lower when you opt for gemstones instead of strictly diamonds. This is one reason couples choose these pretty rings. The other reason is for personalization of the ring(s) she will wear. Whether it is her birth month, both of your birth months or neither, a diamond bridal set is given a personal appeal when you add in gemstones. 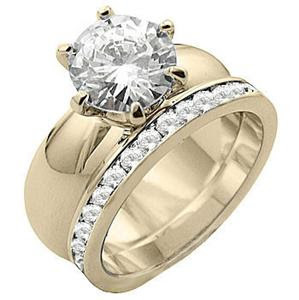 Setting Quality and type: Consider the type of setting you want for you bridal set and make sure the company you buy it from has a reputation for quality, positive customer feedback and of course a return policy in the case that you are not completely satisfied. After all, this is a piece of jewelry that the bride will wear on a daily basis and for the lifetime of the ring.